We have now completed our Foreo ISSA 2 Review, which is the newer version of the Foreo ISSA / ISSA Hybrid. Whereas we rate the ISSA 2 3/5, we rate the original ISSA 4/5 and that remains our recommended choice at the moment. If you are short of time, the answers to the following 3 questions should let you know all you need to about the Foreo ISSA Hybrid. If we have missed something, let us know in the comments. If you want more detail, you can read the full review further down the page. 1 . Is there anything drastically wrong with this toothbrush? No, it challenges the more traditional looking and constructed electric toothbrush and has surprised us by realising how sometimes simplicity is key. Taking away potential gimmicks and focusing on design and practicalities. It will not be for everyone, the younger generation are likely to be more drawn to the ISSA. In essence FOREO are blending the manual and electric toothbrush and have done a fantastic job of that. 2 . Which other brushes should I consider? In all honesty, there is no other electric toothbrush that directly competes with the ISSA, its unique identity carves out its own space. Some of what you get can be purchased in a brush a fraction of the price or you can spend a similar amount on a more traditional option that is packed full of features. But neither will give quite what FOREO are and do via the ISSA. The closest alternative is the recently funded Kickstarter campaign for Amabrush. An innovative concept the pioneering design is intrinsic here, but yet still considerably different in the approach. Simplicity over features seems to be the message here and with this in mind it will be the Oral-B Pro 2 2500 or the Sonicare EasyClean HX6511/50 but they are still some distance apart. For a complete comparison of brushes currently on the market, see our roundup of top UK toothbrushes. 3. Where is the best place to buy the Foreo ISSA Hybrid? The ISSA will not be on the shop shelves of your typical high street chemist or grocer. Primarily sold online via Foreo.com you can purchase from the Foreo boutique in Paris or at select retailers such as Harvey Nichols. It’s also available on Amazon, as are the replacement heads. Delivery is free when buying online and it can be with you in just a few days. Foreo are a new brand when compared to some of the giants within the dental space. The Swedish firm began trading in 2013 having created a beauty product. The future thinking company has grown from strength to strength winning awards, developing new products and being stocked internationally in some of the most premium retail outlets. Pioneering and innovating their intention is to bring revolutionary products to market and the ISSA Hybrid is one such example. It’s a cross between and manual and electric toothbrush. Here are what I believe are the best and worst bits of the Foreo ISSA. Design – Ergonomic and unique design form a body shape that is unusual for a regular toothbrush. Materials – High quality PBT polymer and silicone offer a soft touch, but durable coating that feels good in hand. Sonic technology – Uses sonic technology to offer up to 11,000 movements per minute. Adjustable intensity – Increase or decrease the motion to your desired level, choose from one of 8 settings. Timer – Built in timer with 30 second pacer and automatic power off. Battery life – Up to 6 months battery life from one charge. Cost – It is expensive when you compare the features to a similar brush. Design – Will not be for everyone. Charging – Port cover and USB cable is a tad fiddly. Unboxing the brush, there is a feeling of this being premium. The packaging is white with a clear font in black and grey. It’s a bit like the equivalent of unboxing an iPhone. It feels like a journey and it’s part of the process. The clear window in the box lets you see the brush, but you have to break a seal to get in. Documentation is neatly bound in a clear plastic band and the ‘authenticity card’ gives an heir or prestige. In with the brush itself is the aforementioned card, a user manual, charging cable and white leather pouch case. 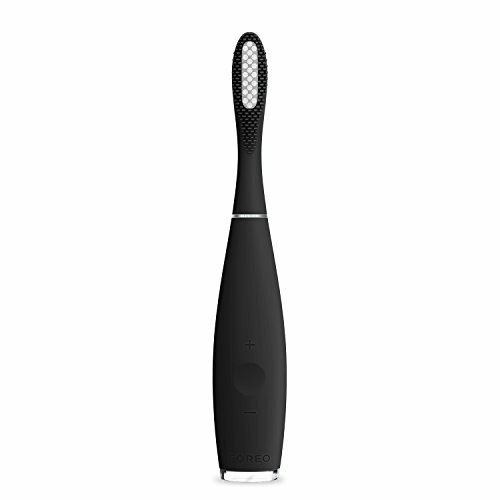 The Foreo ISSA Hybrid is not like what I would call a normal electric toothbrush and I have seen and handled quite a few. When I typically think electric toothbrush, I think longish tubular handle with a detachable brush head. Primarily made of a tough plastic, with a few rubber grips in certain places. Often the brush is white or there are some fairly inoffensive colour options available. Now, that is not to say the ISSA comes in any ‘offensive’ colours but the colour range is refreshingly varied and bold in comparison to the old guard if you like. Colbalt Blue, Cool Black, Lavender and Mint are your four colour choices. I have the Cool Black here. The physical size and shape is not a million miles away from a normal electric toothbrush, but there are more flowing lines and a certain symmetry to the brush that just looks different, but a good different. I am surprised to see that the ISSA has yet to win a coveted Red Dot Award for design. The more shapely brush handle is not as tall as convention would normally suggest and the main brush handle that houses the battery and the motor is a little thicker in hand. Its sort of egg shaped. From a side profile you can see a sweeping arc style to the brush head. Coated in soft touch, smooth silicone that it is the handle is pretty grippy and feels solid in hand, you can get a good grip around it. The likelihood of this slipping out of hand is not as great as other models. In fact I really like the feel of the silicone, it feels great. Design likely dictates as to why the power button and the intensity setting buttons are almost lost amongst the body. Immediately obvious and stand out they are not. The main power button is concave with a + and – icon above and below. Press these to increase or decrease the power of the sonic motor inside. A debossed FOREO logo sits right at the base of the handle. Minimalism feels like it was part of the design brief. On the back of the handle, right at the bottom is a very small cover which when opened reveals the proprietary charging connector for this brush. It is a bit fiddly to open, its a small tab, but given you need charge it once every six month’s, this is easily forgiven. The base of the handle is a transparent plastic that upon charge and at low charge emits a nice white light to signal it is charged or running out of power. The base is flat so it stands upright. Detachable the brush head is, a branded silver metal ring breaks the flow of colour to signal the brush head. This metal is the base of the brush head and is finished to just as high standard as the rest of the brush. Just pull the head on and push it off, this only needs changing once every 12 months. Normally it is every 3. The brush head is oversized in my opinion. 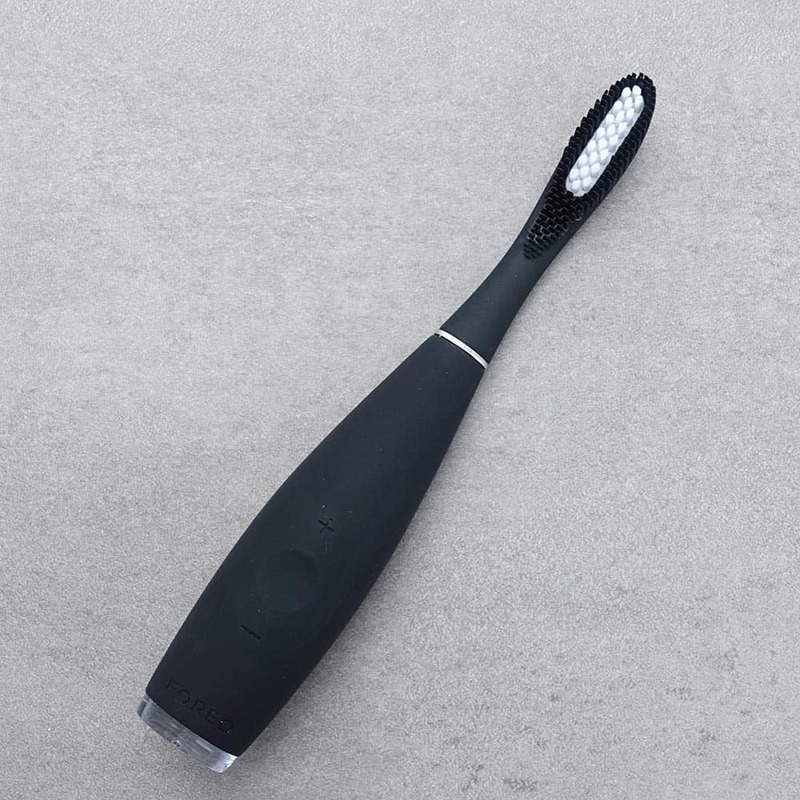 Much larger than a regular manual toothbrush and sort of dwarfs the brush heads you find on an electric toothbrush. In part this is because the ISSA is somewhat of a hybrid in that it is an electric toothbrush but it is not packed with lots of the gadgets and gizmos many of today’s brushes come with. The combination of durable PBT polymer and ultra-soft silicone mean that the bristles are strong on plaque but gentle on gums. A rinse with warm water after use is all that is needed. I am no dentist or biologist to say officially the safety of not changing this brush head every 3 months, but the natural properties of silicone are being exploited in more and more product categories particularly in health and it is medical grade silicone, so I am not too worried. There are two variants of the ISSA brush. On test here is the ISSA Hybrid which comes with a mix of silicone and PBT polymer bristles. The silicone is on the outside with the polymer on the inside. The original ISSA comes with an all silicone bristled brush head. They are interchangeable so you can buy an all silicone bristled head if you prefer. Not supplied but available is a tongue cleaning head. This has a few bristles but a series or silicone blades that brush against the tongue to sweep away bacteria. The brush heads come in the various colour options to match the brush, no mismatching here, unless you specifically chose to. Using sonic pulse technology, the ISSA delivers 183 high intensity pulsations per second, that just shy of 11,000 per minute. This is not as intense as some of the big brand electric toothbrushes, but the way in which you use this brush is more like a manual toothbrush. You may or may not be aware that the way in which you brush with an electric toothbrush and a manual one differs. Although essentially electric with the ISSA you brush like you would with a manual. Some might argue what’s the point of an electric motor if you are going to have to brush like you do with a manual brush. 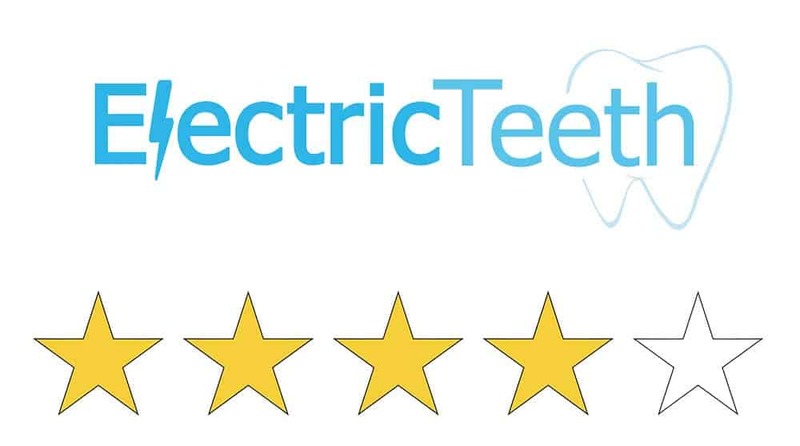 Well whilst the ISSA may not offer all the benefits of an electric toothbrush it offers that pulsation that helps sweep away plaque and food debris. You don’t have to use an electric toothbrush, manual brushes are fine, more important is cleaning regularly, but the electric motor inside does offer benefits. Use the + and – icon to find an intensity that works for you. You have 8 power settings to choose from. The brush remembers your preference until you change it. I use Oral-B brushes on a daily basis and using the FOREO was a little strange. The brush head is really big in my opinion and you have to adjust slightly to get to the back of your teeth particularly to feel like you are cleaning them properly. My teeth felt clean after use. It was not as harsh or aggressive as the Oral-B head I use. In some ways this is good. The silicone is soft on the teeth and on the inside of the cheeks as you move the brush around. A nice level of flex in the head too means the brush does not feel too rigid in use. No pressure sensor is built in but you can hear the motor straining if too much pressure is applied when brushing, so you know when to reduce it, if you listen out for the change in sound. A timer is built into the ISSA with the benefit of a quadpacer too. It is activated when the brush is powered on. This encourages you to brush for the recommended 2 minutes. At 30 second intervals a pause in the motor and a flash of the light signals it’s time to change. 4 sections of the mouth, upper right, upper left, bottom right and bottom left, each should get 30 seconds of attention. Whilst some brushes will automatically turn off at the end of 2 minutes, the ISSA continues until 3 minutes, for those who want to give an extra bit of attention. At the recommended 2 minutes, the pulsations will pause 3 times and the LED light will flash. It will then remain on until the brush turns off at 3 minutes automatically to reduce the chance of over brushing. The water resistant brush comes with a travel pouch, just slide it in and out when you need it. Having been used to hard plastic travel cases with most other electric brushes, I feel they do a better job of protecting the brush. However, there are some extra differences here too. The ISSA has the ability to lock the brush, meaning the brush can’t be accidently activated. This is a novel feature. You need to press and hold the + and – button at the same time for about 3 seconds to lock or unlock it. The light will shine once it is locked or unlocked. Conventional brush heads have hundreds of bristles that can trap bacteria, dust, fluff and more, particularly if put in a bag or pouch like this. However, with ISSA there is a reduced number of bristles. A good rinse and any lingering nasties are washed away. They do recommend spraying the device with FOREO’s Silicone Cleaning Spray and rinsing with warm water afterwards and then allowing to air-dry for optimal results. Essentially an anti-bacterial spray its worth investing in for added peace of mind and protecting the longevity of your brush. Although intensity control options are available there are no extra cleaning modes, which keeps things simple. Many electric toothbrushes offer lots of extra modes that change the number of pulsations etc. In some respects you have this via the intensity settings but it’s not quite the same. Most who have brushes with these features rarely move from the standard clean mode anyway, so why pay for things you might not use. The ISSA does miss out on things like a pressure sensor and connectivity to a smartphone, which are features you can get for a brush of this price. However, the silicone bristles are softer on the gums and teeth than traditional nylon bristles might be and they do not fray like they can. Bluetooth connectivity is desirable for some, but not all, so if this is something you want you will need to look elsewhere. ISSA Hybrid has been trialled under clinical conditions against a traditional manual toothbrush, with a focus on assessing the benefits of silicone in dental devices. Findings have been as follows. One concern for some might be the lack of clinical studies or trials into the brush and how effective it is in comparison to some of the leading and competing electric toothbrush brands. Trials have not yet compared ISSA to Oral-B’s small round rush head or Sonicares more powerful motor, but then again this brush is not setting out to be or replicate quite what they are. This said, we have been advised some studies are being undertaken with some positive initial results. There are thousands of different types of toothbrushes out there, few have been tested under strict conditions and those that have are subject to limitations on the study. So whilst the ISSA may well be different, it is unlikely that the health of your mouth should be affected negatively, in fact if upgrading from a manual brush the likelihood is considerable benefit. The functions of this brush are relatively basic but the refreshingly simple approach, stylish design and everyday use feels very compelling. I usually find myself frustrated by products that appear excessively expensive given what they offer, but the Foreo is somehow different. It feels complete and justifiable. Neat touches like locking the buttons and the LED illuminations are more thought out than the big brands. Well done Foro. One of my pet hates is the lack of battery status icons on an electric toothbrush. You just don’t know when it is going to run out of power. There isn’t an obvious icon here on the ISSA; but wait, the trend here is to do things differently and that they have. The base of the ISSA emits a white flashing light when battery is low. If depleted entirely the motor will stop. Pop it on charge and within an hour a steady white light confirms the brush is fully charged. 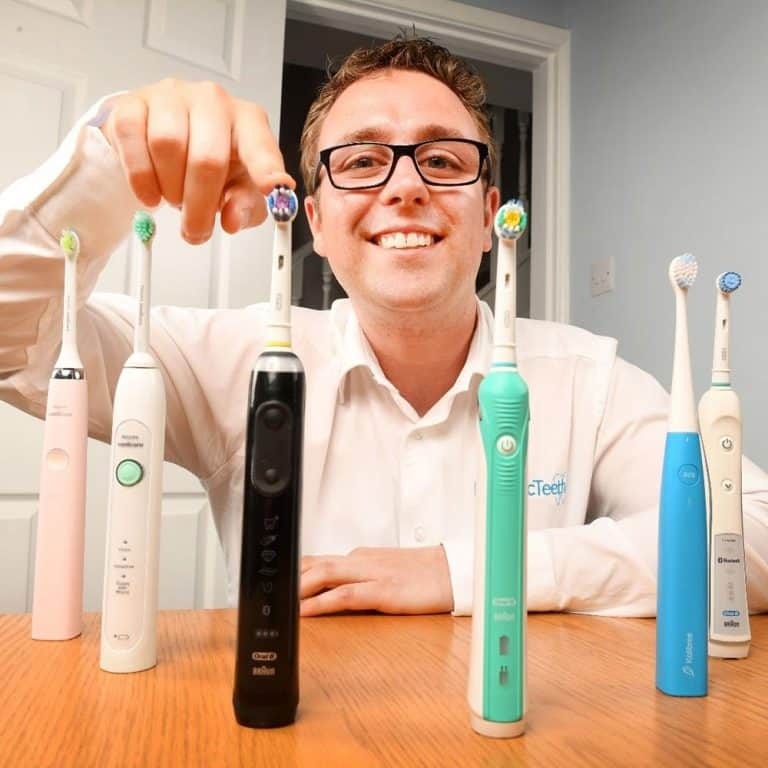 Whilst it does not deliver the same power as other electric toothbrushes, the lack of power sucking gadgetry gives this brush a mind boggling 6 months battery life from just an hour on charge. I have not used any other brush that offers such life from an internal battery. 365 cleaning sessions at full power are possible from this small brush. That is 730 minutes of usage time. Impressive this is, you will need to remember to store that charging cable in a safe place as I suspect you will forget where you put it otherwise when it comes to charging. This is perhaps a slight annoyance. Whilst it is so rare you need to charge it, the way you do it by lifting a cover on the back of the brush and inserting the proprietary connector. This connector is at the end of a USB cable that connects to a USB socket on your computer, a USB equipped mains adapter or similar. I like how it charges via USB, no bulky stand, it need not be on charge for a whole day and it is suitable for those who do not have power in their bathroom, but why not use a microUSB connection or USB Type C, something that is a bit more universal and does not need the proprietary cable? A little frustrating, but I will let it go because the battery life is top notch and you get the feedback when it is low. Noted in the documentation is that the Foreo battery is rated for 5 years use and should not be charged for more than 24 hours. Okay, so here might be the sticking point for some. Now as electric toothbrushes go, this is fairly pricey. The most expensive we have handled to date is £380. More typical is a high RRP, but a selling price that is often 50% less. Oral-B in particular have £250 price tags but actual selling prices of half that. Most electric brushes are under £100 with only the most premium being over this. Where normally you need replace brush heads every 3 months, the ISSA requires replacement every 12. This might suggest a cost saving on the head, but the one head is more expensive at £17 each. So roughly speaking it works out somewhere close to the same price. Based on one user, the cost will be £183 or 17p per day. This is far from the most expensive brush when you break it down, but it is more expensive than the ‘average’ brush. Then again this is not ‘average’. You are paying for the innovation, the design and the uniqueness of this product and how exactly do you quantify this? Knowing what I do and wanting a good deal, there is something about this brush that just leaves me feeling ok about the price. Is it the experience, the attention to detail, the it just works? I think it is a bit of everything. What you also get is the advantage of knowing this price is not subject to regular discounts so you don’t feel cheated. This is a premium brand concious of customer experience and perception. Let’s face it, Foreo’s first and currently only own store, sorry boutique is in Paris…where else?! We always like to test the quality of the brushes we have in for review. Now we don’t put them through specialist lab tests and into expensive equipment that gives digital logs of at what point the brush will break. Casting a keen eye over the brush we look for possible weakness, compare to other brushes and make reasoned arguments. Whilst Foreo might not have the track record of Oral-B or Sonicare, the quality seems to be very good. The silicone construction makes it grippy in hand and we know such can resist a lot of wear and tear. It also feels good to the touch, no harsh plastics. Completely water resistant, the weakness could be the cover over the charging port. Over time it could weaken but it is opened so infrequently this is unlikely to happen. Everything feels solid and well built. The brush comes with a 2 year warranty as standard. This is typical of most other guarantees but what is particularly interesting is their 10 year quality guarantee. Limited to one time use, but available to be applied to up to 5 items in a single order, if a defect occurs with your FOREO device after the initial 24-month period but within the period of the 10-Year Quality Guarantee, subject to first obtaining pre-authorization you can get 50% off a new product. This also applied if a defect occurs with your FOREO device during the initial 24-month period, but the device was not purchased from foreo.com and you are unable to provide the original purchase receipt for any reason. For me this shows a real sign of commitment and quality in the product and a focus on providing customer satisfaction. On paper or looking at the features of this brush online, I would struggle to justify saying it was worth the price tag. Having unboxed, held and used it I can’t say that for everyone this is a must have brush; it’s still a bit of a stretch to say go spend £149 though! But, there are so many small things that make that price more appropriate. An experience of an unboxing, the fantastic quality in the hand, the look, the simple attention to detail and the 10 year quality guarantee. Few will go raving about an electric toothbrush but Foreo have done something that few others have. They are what Apple are to the world of tech. A Foreo brush will look at home in many places but if you crave fashion, like the finer things in life and appreciate style, detail and quality then you know what to buy as your next toothbrush. For those a little more price sensitive and not so fussed by the fashion, strong performance can be gotten from cheaper alternatives, notably the Oral-B Pro 2 2500 or the Sonicare EasyClean HX6511/50. Is the Foreo ISSA Hybrid an oscillating brush? No, it is a sonic toothbrush. Does the Foreo ISSA Hybrid have a pressure sensor? No, but when brushing the motors sound will change if brushing too hard. Does the Foreo ISSA Hybrid have Bluetooth? Does the Foreo ISSA Hybrid come with a warranty & how long is it? If purchased new from Foreo it will come with a 2 year warranty. Does the Foreo ISSA Hybrid have a built in timer? Yes. It runs for 2 minutes. At 30 second intervals the brush motor will pause once and a light will flash on the base of the handle. At 2 minutes the brush motor will pause 3 times and the light flash 3 times. The light will remain lit for a further minute at which point it will automatically turn off. The battery lasts up to 6 month’s. 730 minutes of sage time of 365 cleaning sessions, if used twice a day for 2 minutes. Yes, a USB cable with proprietary connector. Can I use the Foreo ISSA Hybrid in the shower? Yes. The brush is water resistant. Yes, it is more of a sleeve/pouch into which the rush slides. Do you own or have you used the Foreo ISSA? The Foreo ISSA Hybrid brush spoken about in this review was provided by FOREO PR department. Electric Teeth did not purchase this model. No financial reward was provided to conclude the review the way that we did.